Alex has been given a saccharine, sappy, silly-sweet picture book about Birthday Bunny that his grandma found at a garage sale. Alex isn't interested--until he decides to make the book something he'd actually like to read. So he takes out his pencil, sharpens his creativity, and totally transforms the story. 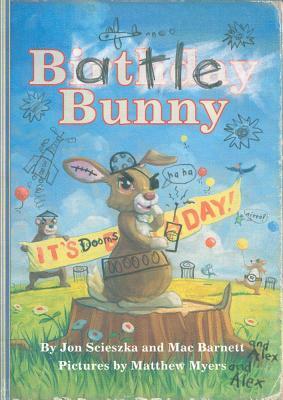 Birthday Bunny becomes "Battle" Bunny, and the rabbit's innocent journey through the forest morphs into a supersecret mission to unleash an evil plan--a plan that only Alex can stop. Featuring layered, original artwork that emphasizes Alex's additions, this dynamic exploration of creative storytelling is sure to engage and inspire.